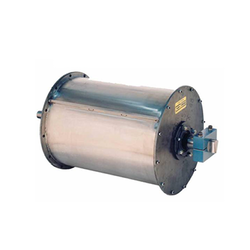 We are a leading Manufacturer of magnetic drums from Surat, India. Our Magnetic Drums possess higher strength in comparison of electromagnetic drums. These permanent magnetic drums are made using permanent magnets, which are long lasting in quality and useful for whole of the life. The power of these permanent magnets does not reduce during normal use. Volume of material which can be handled by permanent magnetic drums depends upon the diameter length of the drum. Looking for Magnetic Drums ?